v.10 – After Job had prayed for his friends, the Lord made him prosperous again and gave him twice as much as he had before. v.11 – All his brothers and sisters and everyone who had known him before came and ate with him in his home. 11. Then came there unto him all his brethren, and all his sisters, and all they that had been of his acquaintance before, and did eat bread with him in his house: … (Emphasis on “Then” mine). v. 11 contd. – and each one gave him a piece of silver and a gold ring. People cannot handle unending pain, hopelessness and relentless tragedy. Human beings are finite. They can only bear so much of your troubles and they become depressed and overwhelmed. So if you have a protracted problem, while you need the right human agency to assist you, do not cling to man, cling to God. Don’t wear people out with your groaning and complaining, pour it on God. Also, do not turn yourself into a prayer project. Whoever is praying for you wants to see a turnaround, a testimony. Don’t hold it against them if they lose their passion for your case or give up. They are only human. But GOD? He never gets tired of listening to you. And don’t be sanctimonious in letting it out. Remember He commended Job for sincerely expressing his frustration and confusion. Personally, I think that is part of the reason Job maintained his sanity, his faith and ultimately survived the ordeal. His honesty. Pious silence will kill you when your heart is filled with bitterness and anger. So bring it on! Jehovah can take it. He will deal with you in your situation and He will be with you. It may or may not end precisely the way you want it but He will cause all things to work together for your good. Halleluyah!!! The scriptures in this piece besides those from the KJV came from the New International Version. Oh Edith this a much needed message. The bible says, "Cast your burden upon the LORD and He will sustain you; He will never allow the righteous to be shaken." Psalm 55:22. As one writer states, "Cast all you cares; personal cares, family cares, cares for the present, and cares for the future, for yourselves, for others, for the church, on God." Jesus instructs us, "Come to me, all you who are weary and burdened, and I will give you rest." We were not built or called to carry our burdens or the burdens of others. We were told to pray for ourselves and others and have faith in God who is able to do above and beyond what we ask. I thank God for using to you plant or water this important message in our lives. You are blessed beloved sister! My dearest Sister Pam, I give God praise. When we expect man to do what only God can do, we're bound to be disappointed. Hope you and your family are fine. Love you! "If you have a protracted problem, while you need the right human agency to assist you, do not cling to man, cling to God. 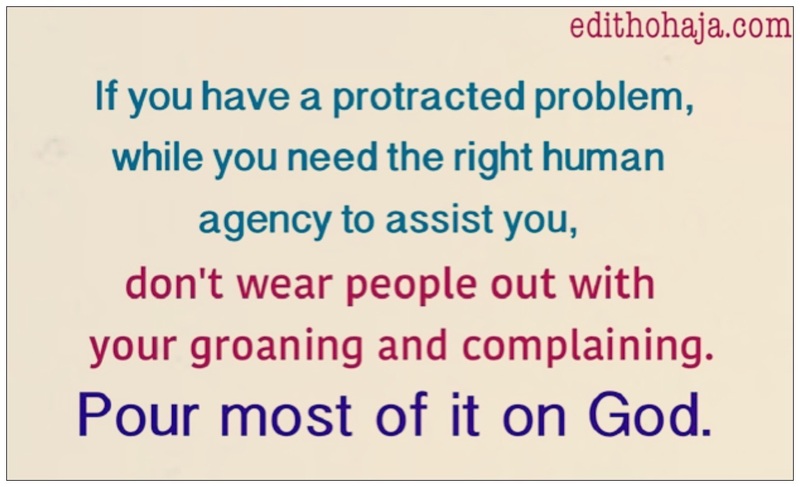 Don’t wear people out with your groaning and complaining, pour it on God. – Also, do not turn yourself into a prayer project. Whoever is praying for you wants to see a turnaround, a testimony. Don’t hold it against them if they lose their passion for your case or give up. They are only human." These are all that I have learnt from this exposing piece. Thank you very much Ma. I really hope that all students read this. Thanks once again. Glad you paid attention, Lawrence. But the advice here is not only for students, it's for everyone. God's grace in your studies! kalaowuborebecca@yahoo.com. That is right Ma. Most people just go about complaining about their worries and problems to humans, forgetting that they may not really solve it but rather go behind their backs to mock them. The bible tells us to cast all our cares or worries on Jesus. I have learnt to hit it all on Christ. IF ONLY WE COULD LEARN TO CAST OUR CARES ON GOD LIKE HE ASKED US TO.THANK YOU SOOOO MUCH MA. Humans are fallible so why put your trust on them when you have a God who can do all things for you without a complaint....oh! what are a great man i have in Jesus. the most humble human ever that liveth. the only one i can trust and lay my charges at his feet without bothering. It can only get better with God alone. Beautiful! There's just no one like our God. He is altogether lovely! Bless you, Chisolim! There is nothing God cannot handle, he is able to do every thing , he has the power to do all things. our trust should be on him alone not on man. indeed we should bring it on, Jehovah jireh can handle it. very interesting piece. Our God is able. That is why we call Him the Almighty. "Bring it on", I love that. God is always there to grant us our hearts' desires. God bless you, ma, for sharing this. And bless you too far reading and appreciating it. Only him can do what no man can do, he is far superior than humans ,so why carry our problems to an ordinary human being that can't do anything, it's boldly written, cling unto God and watch your heart desires been attended to. That is why christians describe God as omniscience, omnipresence and Omnipotent, He is all powerful and all nations and creatures bow at His feet. That is why Christians describe Him as Ominiscience, Ominipotent and Ominipresent. He is all powerful and all nations and creatures bow at His feet. Job really went through a lot and one interesting thing to learn from his story is that he never gave up on God. He poured out all that troubled him on God and God brought him into a season of restoration to regain lost grounds.